Ahoy mateys. Since my college kids went off to school I’ve been catching up on some design work and it’s so fun to be back working on spaces with clients. 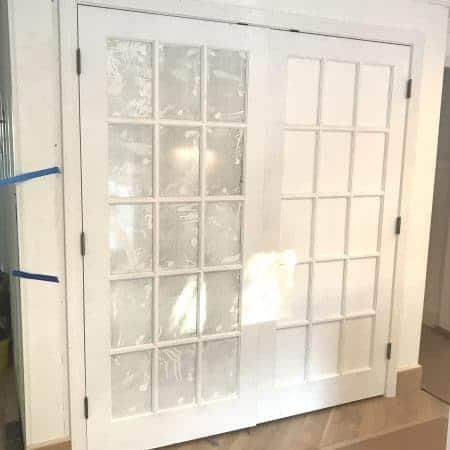 As most of you know, I’m not a professional designer – I don’t have an interior design degree or any certifications – but after casually helping a few friends with spaces in their houses, some of their friends kindly asked for my help, and it’s grown from there. This past year I’ve had a few inquiries about the e-design I used to offer via the blog and YES, I am bringing that back now that life has quieted down a bit! More about that in the near future. One of the projects I’ve been working on is for a most special little client. Did I tell you I’m going to be a GRAND-AUNT?? My niece who got married at the end of summer last year is having a baby boy in November! 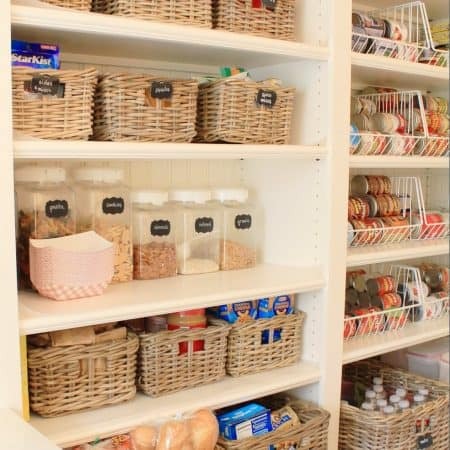 I have the distinct pleasure of dreaming up a nursery for this sweet munchkin and thought I’d share some ideas with you. Affiliate links are included in this post for your convenience. Read more about affiliate links here. 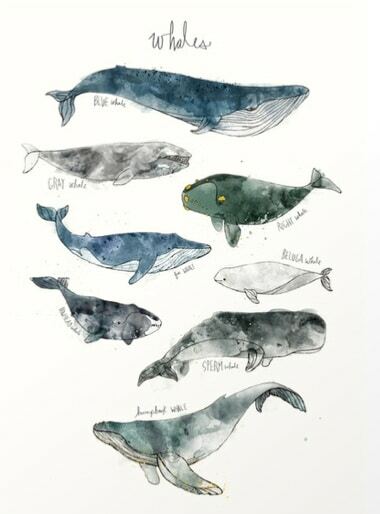 My niece and her husband live on Cape Cod, and while I typically try to avoid themes, I couldn’t pass up this perfect opportunity to use the most adorable watercolor WHALES print by Amy Hamilton!! Could that not be cuter for a baby boy?!! 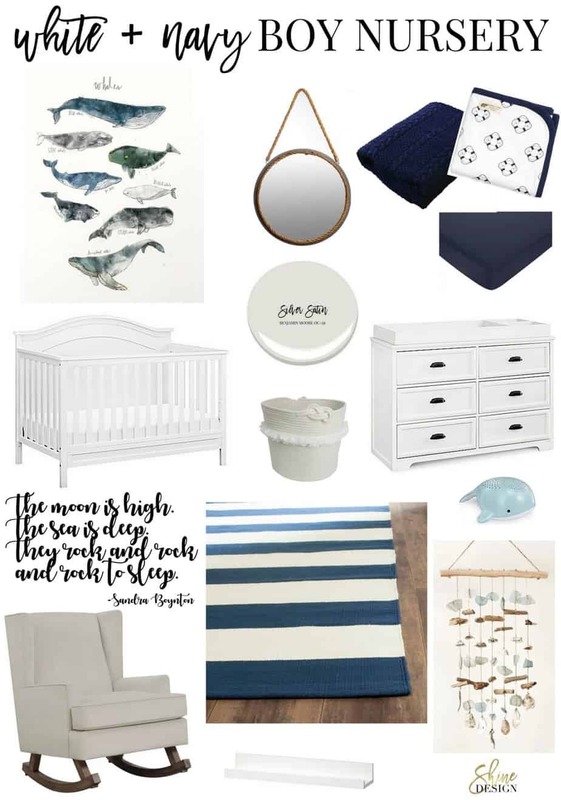 With this piece as our inspiration, here’s what I initially put together for his little nursery…….. 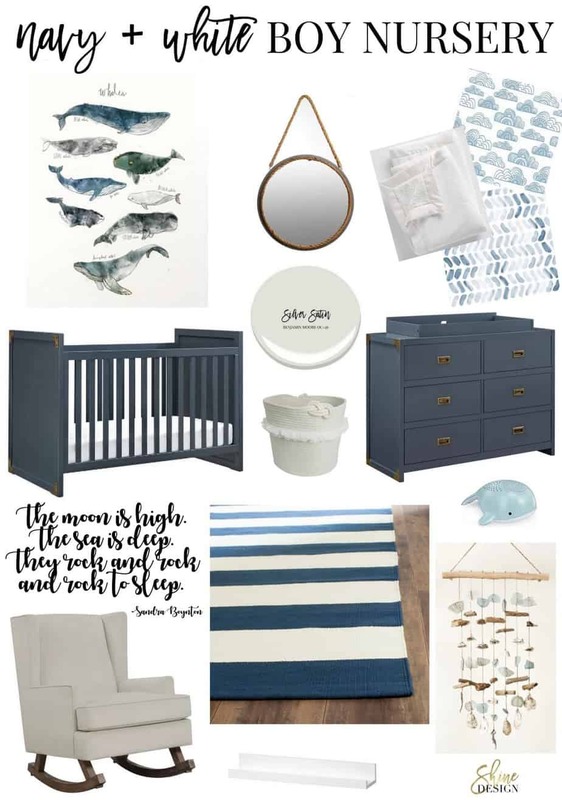 This campaign style crib and dresser in marine blue! LOVE. I adore the brass hardware, and those clean modern lines. 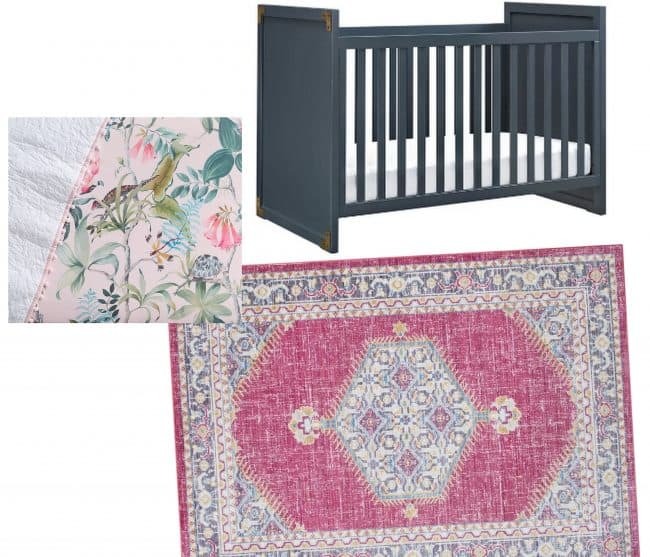 The crib converts to a toddler bed, and the dresser could be used for years ahead in the little munchkin’s room without the changing table topper. Ultimately I think my niece and her husband are going to go with a white furniture option because this crib not only converts to a toddler bed, but eventually the curved back of the crib can be used as a full-size bed headboard, so it does give them years of versatility. When I swapped out the campaign style crib and dresser with the white, I changed up the bedding options a bit to bring back in a bit more of the navy, and the design went more WHITE + NAVY than the other way around. I could not resist that swaddling blanket when I saw the name of it. WELCOME ABOARD!! Oh my gosh I love him already. An upholstered rocker is something I’ve done before for clients and it’s always a big hit. Eventually when you no longer need a nursery rocker (rue the day!) the rocking legs can be replaced with furniture legs and used as an accent chair anywhere in your house, so again, it gives you years of versatility. Book ledges are great for a narrow wall – and did any of you recognize the quote on the design boards from Sandra Boynton’s Going To Bed Book?? If you’re a mama you’re sure to have read that book once – or one hundred million times! I’m thinking about using that line on a pillow using the wax paper graphic transfer method. I’m sure more changes will be made but at least we have a jumping off point. So fun to hash this out with you while I wait for my cutie patootie to arrive! 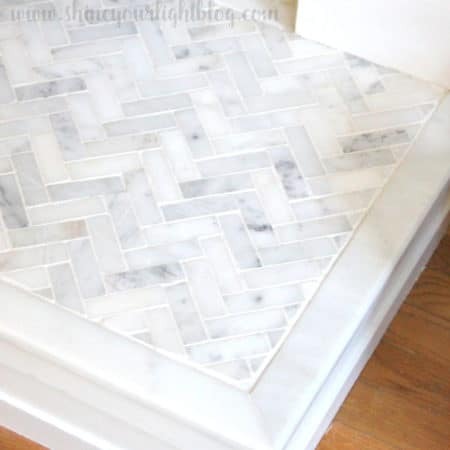 If you want to see more Shine Design boards, visit the Paint Color Crush archives here! maybe it’s because i have a baby boy but i just love this look! the seaglass and driftwood hanging is just beautiful! Thanks Cassie! My niece collects sea glass at the Cape so I think we’re going to make something similar inspired by that wall hanging. Your designs are beautiful, Lisa! 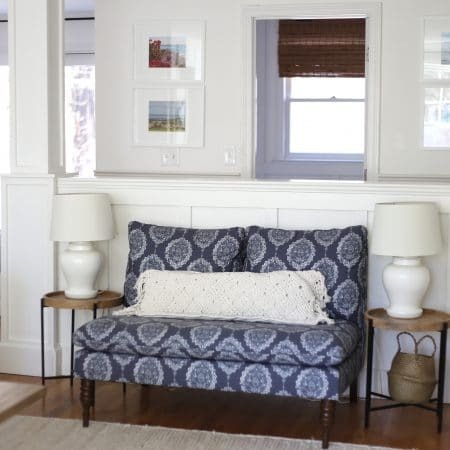 Great coastal style without being too themey and I love all the blue (obviously!) Always so exciting to have a new baby in the family! One of my nieces is due in November so we have another one on the way too! Enjoy the rest of the week! Thank you so much Shelley! That’s exciting about your niece expecting too! We can’t wait for our new babe to arrive!! The Going to Bed Book is a multigenerational favorite in our family. I give books as baby gifts, so I always have at least one or two extra copies on hand. to in your September 2016 blog on the ink transfer technique? Where did you find the sea glass and driftwood hanging? Thank you for continuing to inspire us with your creativity! Hi Jodi! To flip text in Word, click on Text Box in the navigation bar, type your text, then click on the text box outline and go to Format Shape. Enter 180 (degrees) for X and it will flip the text. For an image you can click on the image box and flip it in the same manner. There is a link that will take you directly to to the sea glass and drift wood hanging under the design board in this post! Hope that helps, and thanks for stopping by! Love the “Going to Bed” book quote — brings back happy memories. Everything looks great! That was one of my favorites when the munchkins were small! That is the sweetest nursery!! The campaign baby furniture is AMAZING. I am continually blown away by the cool baby stuff the have now. Shelley I have to find someone else to design a nursery for because I couldn’t talk my niece into the campaign style, and I’m pretty much obsessed with it! But this is still one of my favorite rooms to do!